I usually avoid sausage because most casings, even the hormone-free ones, use pig products. But thank god for DiPaola Turkeys from New Jersey. Their casing are made of collagen! And their flavoring is awesome. They are at the Green Market at Union Square and also the Green Market in Brooklyn, near Borough Hall on Saturdays. I squeezed the sausage out of the casing and fried it like ground beef. It was only upon doing this that I realized the casing was collagen. So it’s not very good looking but, boy, is it yummy. 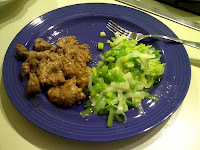 I love leeks and they are a great counterpoint to meet. Leeks and green vegetables are alkaline whereas meat is acid, so it’s smart to eat the two together in one meal to balance your acid-alkaline pH.